Time to stir up the hornet’s nest a bit. We can’t move the nest away from the house unless we get all of its occupants out and buzzing about, after all. I’ve heard all kinds of reasons why people buy mirrorless cameras. Some are reasonable, some are a bit misstated, some just aren’t correct. Most of the time, the mirrorless camera purchaser makes their comparisons to DSLRs, so I’ll stick to that here, but I’m seeing more and more “convenience mirrorless shooters”—one lens with a lot of focal range stays on the mirrorless camera all the time—so technically to defend a mirrorless camera purchase you’d also have to compare against all-in-ones, such as the Panasonic FZ1000 or Sony RX10, for example. Here’s the thing: the primary reason why someone buys a mirrorless camera is that the DSLR makers are perceived as not providing something that the purchaser wanted. That’s it. It’s not because mirrorless is “better” than DSLR. It’s certainly not that mirrorless is “cheaper” than DSLR. It’s not because the mirrorless makers have been in the ILC camera business longer (though Leica might make that claim). It’s not that mirrorless cameras are simpler and easier to learn to use than DSLRs (I’m looking at you Olympus). I’m sorry to say that Canon and Nikon, the two primary remaining DSLR vendors are moving about like a sumo wrestler trying to run a marathon: slow and awkward. Occasional oddly positioned experiments aside—the Nikon 1 comes to mind—the duopoly in ILC cameras just isn’t delivering everything shooters want. The seven dwarves correctly figured that out and came out with a way to appear to create a niche that delivered many of those things: mirrorless. Size and Weight. Everything is conspiring against large size and heavy weight these days. Airlines. The aging population of SLR/DSLR shooters. The young not being quite as consumption-happy as the Boomers. The list of reasons is fairly extensive. One of the things that high tech does exceedingly well is put additional capability and quality into smaller and smaller products. That's pretty much an expectation from consumers these days: products get more compact, yet better. The DSLR makers ignored this for far too long. Even when Canon tried the smaller, lighter SL1 DSLR, they got something incredibly wrong: the SL1 was perceived as a less capable camera than its larger Rebel brothers. Nope, you have to get both things right: better and smaller. Indeed, that’s one of the things that held m4/3 back for awhile: it was perceived that the small 12mp sensors just weren’t delivering what the constant parade of more pixels in APS and full frame were. Size of System. This is related to the first, but a little trickier. I’ll get to the tricky part in a moment. First, let me point out that an m4/3 body, 24-200mm (equivalent) worth of fast zoom lenses, and a couple of useful primes fits in an incredibly smaller bag than does a full frame DSLR with the same things. If you really want the advantage of an interchangeable lens camera, that means that you’re carrying lenses with you besides the camera. So while the size of the camera itself is important, what’s actually more important is the size of the system you’re likely to carry. A large, heavy backpack is less convenient than a smaller, lighter shoulder bag, for example. Of course you give something up in getting the smaller system: smaller sensor, sometimes crammed hand positions for controls, and the need for faster aperture lenses to keep various equivalence factors at bay, amongst other things. But I can attest to the fact that even going out to shoot wildlife with an Olympus E-M1 produces a significantly smaller and lighter bag than doing so with my D810. I said this point was tricky, and the Sony A7 is exactly where that tricky bit comes into play. The A7 series uses a full frame sensor. It needs lenses with larger image circles, which means more glass (larger and heavier). Technically, a 24-70mm f/2.8 zoom for the A7 is pretty much going to be as big and heavy as a 24-70mm f/2.8 zoom for the Canikon DSLR full frames. Sony decided to produce a smaller 24-70mm f/4 instead. I’d also argue that this lens shows some further design compromises to keep its size down. it’s a decent lens, especially in the central area, but it relies on software lens corrections fairly heavily to rid it of corner issues. That said, the fact that Sony understood that it wasn’t just body size, but system size too, that was important to consumers shows that Sony might have been listening better to the customer base than Canikon. Actually, I personally think Canon and Nikon heard the same things, but they’re just acting like lazy duopolists. Better autofocus. Surprised? Let me explain. Contrast detect autofocus systems (most mirrorless cameras) have one advantage over phase detect autofocus systems (DSLRs): they are extremely precise in focus plane. Phase detect is fast at moving focus—especially with tracking fast subjects in motion—but it suffers from a lack of absolute precision. For a static subject a DSLR gets focus very close to perfect extremely fast. A mirrorless system gets that same thing precisely focused but not quite as fast (especially as we move into telephoto focal lengths or long focus moves). It also doesn’t help that most DSLR focus systems are sophisticated enough that it takes dozens of pages to figure out exactly how they work and a half dozen settings you need to dial in for any given subject. Thing is that most people are taking photos of non-moving (or at least not fast moving relative to the camera) subjects. Aunt Betty standing at the rim of the Grand Canyon, for instance. Cousin Billy climbing his backyard jungle gym. The new friends you met on the cruise that are sitting at your table. In almost all the most common photography situations, just using Single Servo focus on a mirrorless camera is going to dial in the focus plane with more precision and fast enough. That’s especially true when you consider you can position the focus point almost anywhere—and often via touching the LCD these days—whereas the DSLRs limit your focus point choices to a smaller central area. To be honest, it isn’t really “better autofocus,” but “more usable autofocus for what the customer typically wants to record.” While some of the mirrorless cameras are closing the gap on overall focus performance, the top DSLR autofocus systems are very fast, very flexible, reasonably precise, and track even fast-moving subjects exceedingly well when set right. In some cases, shockingly well now that some DSLRs are mixing color information with focus information. EVF. Some of you reading this will be surprised to see this in the list. You’ll argue that the EVF has a lag to reality, and that even in its current XVGA form it is a bit crude, especially in low light. But the reason that EVF is on this list is the same reason that DSLRs took over so fast from SLRs: the broad consumer base is terrible at making good photographic decisions without help. With film, they’d take pictures and get them back a week later, and they had no idea what they did wrong. With DSLRs, they could at least chimp the shot afterwards and see that they got something wrong. With EVFs they can see things like exposure problems in real time, closing the feedback loop completely (at least on well designed mirrorless cameras). They can even see special effects instantly, picture styles, and a host of other things they might want to set. My Olympus OM-Ds, for example, can be set to show where shadows are blocking up or highlights nearing clipping in the viewfinder in real time. I can’t get my Nikon DSLRs to do the former even while chimping the shot ;~). Not everyone wants to spend hours, days, weeks, or years learning how to make all the right settings the right way without any instant feedback. Indeed, the majority want just the opposite: show me instantly what I’m doing so I can fix it immediately. I’d also point out that the viewing screens in DSLRs have slowly but surely been stupidified by camera makers. You wanted better focus, so they gave us autofocus systems. Then you complained that the viewfinders were too dim, so they took out all the focus aids and concentrated on just brightness. Frankly, it’s easier to see if the camera has actually focused with a mirrorless camera than it is with a DSLR these days. Mirrorless cameras with peaking settings make that absolutely obvious, too. Again, I’d say that the DSLR camera makers were lazy. The Nikon Df is a good example. If there’s any DSLR made lately that’s likely to be manually focused, that’s the one. Nikon made a slight adjustment to the viewing screen, but did any of the manual focusing aids return? No. Technology. The mirrorless camera companies are now perceived as being the ones incorporating the most new technology into cameras. Sensor-based image stabilization, multiple-shot high resolution, 4K video, focus peaking, real time view of long exposures, and more (including that EVF I just mentioned and all its new capabilities). DSLRs are now being perceived as iterating dinosaurs (hmm, Jurassic World, anyone?). All the “cool technology” is happening in mirrorless first. Okay, but I’m going to temper that a bit. First, the mirrorless camera companies have to innovate and move into new technologies fast. They only have 23% of the market (2014 numbers), and it’s actually worse than that when you consider that Canikon have some of the mirrorless market, too. If the mirrorless camera companies competed solely on price or performance, they’d be crushed by the two big companies. They have no choice but to lead the R&D parade and discover the technologies that really should be in cameras. But consumers are easily fooled by technology, too. Take image stabilization. This is a “good enough” solution not a “best practice” solution. I’ve written for over a decade the following: turn off IS and stabilize your camera (e.g. well chosen and set up tripod) and you’ll almost always get better pixel level results. IS/VR systems are moving something (lens elements, sensor) during the exposure. And they’re not moving those elements perfectly in sync with the motion. Not even close. While you might not be able to easily measure it, you’re losing edge acuity with IS systems turned on. Of course, if the alternative is to get totally smeary results because you can’t hold the camera steady, then IS is certainly useful. Fujifilm, Olympus, Panasonic, Samsung, and Sony are pushing interchangeable lens cameras forward with their mirrorless entries, no doubt. They’re doing so faster and better than Canon and Nikon are with their DSLRs. (Pentax is a mixed case, somewhere in between, but probably closer to Canon and Nikon given how slow they’re moving, even with new technologies.) The reason why you consider and possibly purchase a mirrorless camera is generally because of this progression. The DSLR makers aren’t giving you what you wanted, or not doing it well enough or fast enough, so you look at the alternative. Whether you buy a mirrorless or DSLR camera really has very little to do with the presence or lack of a mirror, as it turns out (witness the Sony SLTs, which are in between). It’s really about whether a camera company is providing you with what you want. In contradiction to that, there’s the inertial pull of 200m+ EOS and F-mount legacy lenses out there. After all, you’re buying an interchangeable lens camera whether you go mirrorless or DSLR. Thus lenses are an important consideration. This is why both Canon and Nikon have made incredible mistakes in their crop sensor DSLR systems: they didn’t fill out the lens lines. That’s allowed the mirrorless companies time to not only create new lens systems of their own, but in the case of Fujifilm and m4/3, arguably fill those lines out pretty well. Samsung and Sony aren’t far behind. 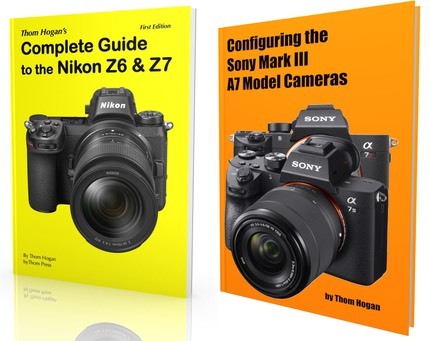 Realistically, you’re buying mirrorless systems because Canon and Nikon aren’t giving you what you want, simple as that.